Gather 'round, boys and girls, to see how we'll zoom between Detroit and Chicago "sometime in the not too distant future," as the description of this video casts it. The fanciful tale, mixing live action and animation, shows a baseball fan without a car leaving his suburban Chicago home at 9:35 a.m. on a Saturday to see the White Sox at Comerica Park early that afternoon. 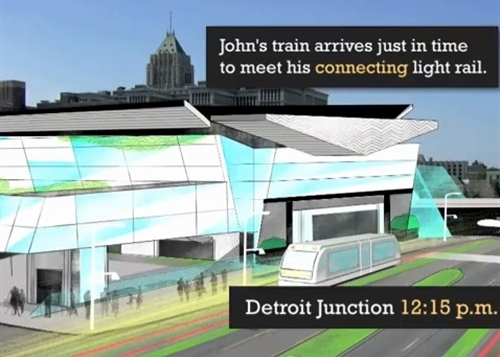 He catches a 10 a.m. high-speed train that reaches Detroit's New Center area in two hours and 15 minutes. Woodward's light rail line drops him at the ballpark at 12:25 p.m. The imaginary 300-mile trip, which starts with an electric shared vehicle ride to the Illinois station, is depicted in under four minutes by a New York nonprofit called America 2050. It's a New York policy center focusing on "transportation, sustainability, and economic-development issues impacting America's growth in the 21st century." (Yes, 2050 seems further than "the not too distant future," but why quibble?" The video is just a tease, but it does have a baseball theme and footage of Detroit with computer-generated rapid-transit lines overlaid. The clip has been seen nearly 15,000 times since being posted in the not too distant past. Back here in the real world, the latest sign of progress on the M-1 Rail streetcar project is an announcement that a California firm will be construction manager and general contractor for the loop between New Center and Hart Plaza. And late next month, policymakers, executives and transportation wonks will discuss high-speed rail plans at MDOT's first Michigan Rail Conference. So who knows how distant this future actually is.